U22 XT offers a maximum of flexibility as fully bus powered USB device with pristine professional 24-bit audio quality. The interface features 2 analog input and 2 analog output channels with RCA line inputs, a microphone preamplifier with XLR input and support for +48V phantom power, a Hi-Z instrument input for guitars, a high quality headphone output and TRS line outputs. Master and headphone volume as well as monitoring are controlled on the front panel. Included with U22 XT is the Bitwig Studio 8-Track software, the trim and effective digital audio workstation to start producing, performing, and designing audio like a pro. 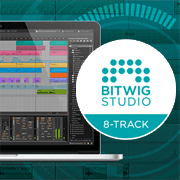 With Bitwig Studio 8-Track, you can start working right out of the box without other additional software. Record and arrange, improvise and perform, or do it all at once, with this professional solution developed by musicians, for musicians. U22 XT is also available as a complete recording bundle with a microphone and headphone, the U22 XT cosMik Set. 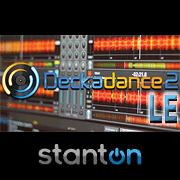 Deckadance LE v2 from Stanton - a powerful professional DJ software that continues to elevate the freedom of creative expression for remix and groove producers, turntablists as well as club, mobile and home DJs. With the included license, you can quickly load your favorite tracks and instantly mix them like a professional DJ through the outputs of U22 XT. Our website always shows the latest information on what we currently ship with our products. Depending on the production date, it can sometimes be possible that a different software package is included with the U22 XT at a local reseller. The actual content is mentioned on the retail box of the product itself. If you are unsure, please contact us. Bro C of the Reviewer's Revival blog in Canada checked our U22 XT in an extensive, entertaining, and very detailed review that you should not miss. Check it out and read the full text here! Mike Metlay wrote in RECORDING May 2017 (USA) a review of our U22 XT: "... does it job with no fuss." 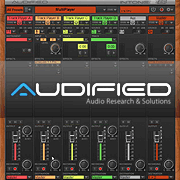 / "... all users will like how this interface treats their sound." - you can read and download the full review as PDF here. Felix Klostermann from online magazine Bonedo (Germany) checked our U22 XT in detail and mentioned:"good sound" / "simple concept" / "hardware controls" - read the full german language review here! The August 2016 Beat Magazine (Germany) contains a review of U22 XT from Henning Schonvogel: "low noise microphone preamp" / "high performance" / "lightweight solid constructon"